Low gas prices are likely the reason why there won’t be any increases to Social Security benefits for both disabled people and retirees next year, economists say. This is because the annual cost-of-living adjustment, or COLA, which is based on the government’s measure of inflation, has been kept at a minimum by lower gas prices, actually causing prices to drop below 2014 levels. American Institute for Economic Research economist Polina Vlasenko said that there’s a “very high probability” that Social Security benefit increases in 2016 “will be zero”. Congress passed a law for automatic increases for Social Security beneficiaries in 1975, a time when inflation had been at a high and there was pressure to enact automatic increases for benefits. Our attorneys at the Hankey Law Office in Indianapolis help individuals file and appeal for Social Security disability benefits. If you need legal assistance regarding these matters, you may speak with a member of our legal team by calling our offices today at (800) 520-3633. According to nonprofit organization Center for American Progress, instead of passing a measure that would effectively terminate concurrent benefits of Social Security Disability Insurance and unemployment insurance, Congress should instead put into practice policies that would encourage more people with disabilities to rejoin the workforce. CAP’s poverty to prosperity program director of policy Rebecca Vallas said that for the fewer than 1% of people receiving disability and unemployment insurance who qualify for both insurance programs, the average combined benefit is only $1,100 each month, meaning cutting these benefits would seriously jeopardize these individuals’ ability to sustain an adequate quality of life. Our attorneys at the Hankey Law Office are prepared to help individuals who need to file Social Security disability benefits in Indianapolis or address any disability claim concerns and issues regarding the Social Security Disability Insurance program. Call our offices today at (317) 634-8565 to speak with a member of our legal team. The AARP has just released a new book titled AARP’s Social Security for Dummies, 2nd Edition, according to aarp.org. The book is meant to be an informative and easily accessible resource that details everything there is to know about the Social Security Administration, its programs, and its relevance especially to the average retiree. Among the information included within the book is how the SSA’s policies work, which policies cater to a citizen’s specialized needs, and how to make use of Social Security programs to improve your overall retirement plan. AARP’s Social Security for Dummies, 2nd Edition can be bought online and at retailers all across the country in print and electronic formats. While this is a great resource, the lawyers at the Hankey Law Office also understand that this book can’t address your individual concerns. We can answer any questions you have, help you with filing, and more. Call our offices today at (317) 634-8565. U.S. Attorney Rosa Emilia Rodriguez Velez for the District of Puerto Rico announced that a federal grand jury has indicted on Monday and Tuesday, January 12 and 13 respectively, psychiatrist Luis Escabi-Perez and 39 others for violations against the rules of the Social Security Administration (SSA), according to a January 15 article on eNews Park Forest. Escabi-Perez submitted false psychiatric medical reports to the SSA to support disability claims submitted by his patients. He charged around $100 for every medical visit and a fee of around $500 for the preparation and submission of a psychiatric medical report to the SSA. Escabi-Perez was also charged with wire fraud and, along with five other individuals, is facing additional charges of conspiracy to defraud the United States, theft of government property, concealment of failure to disclose an event to the SSA, and false statements in determining rights for disability. The attorneys of the Hankey Law Office know that many individuals and families in Indianapolis truly need disability benefits to maintain their quality of life. If you need help filing for benefits or have concerns about the process, call our offices at (317) 634-8565 today. Citizens of the United States who regularly receive Social Security benefits every month will notice that their monthly benefits will slightly increase starting in January 2015 to cover the price of inflation, The Wall Street Journal reported on October 22. The Social Security Administration announced that the cost-of-living adjustment was pegged at 1.7% for 2015, matching earlier estimates from the Department of Labor. To be specific, retirees will see the increase in their January payment while those who receive Supplementary Security Income (SSI) will start receiving slightly increased payments on December 31. In contrast to 2015’s 1.7% increase, this year’s benefits increased by 1.5%, and in 2013, there was another 1.7% rise. Filing for Social Security disability benefit claims is usually a long and tedious process. 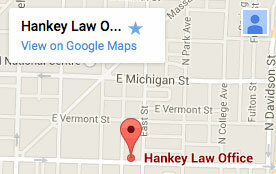 If you need help throughout the process in Indianapolis, one of the attorneys at the Hankey Law Office may guide you through your paperwork. Call our offices at (800) 520-3633 today to make an appointment. United States Senator Bernard Sanders (Independent of Vermont) strongly argued that the proposal brought forward by HoR budget committee chairmain Paul Ryan (Republican of Wisconsin) to cut Social Security and veterans’ benefits is wrong, the VT Digger reported on October 7. Ryan proposed augmenting the defense budget by re-appropriating “savings” from Social Security. These so-called savings would be grown by using a different formula to calculate the price of living, which would result in large cuts to benefits. Sanders claimed this calculation formula inherently under counts inflation and would significantly affect both Social Security benefit recipients and disabled veterans. The attorneys at the Hankey Law Office know that many Indianapolis residents depend on disability benefits to maintain their quality of life if they are unable to work. If you need help filing a claim or appealing a rejected claim, our legal team may be able to help you. Call our offices at (800) 520-3633 today to learn more. Many people receiving Social Security disability benefits are concerned that they will stop receiving benefits in retirement. Never fear! While some private disability benefits end at retirement, Social Security disability benefits are still paid in full. And, there may be a way for you to earn more during this stage of your life. You are entitled to half of your spouse’s retirement fund. According to fool.com, if half of your spouse’s benefits exceed the amount your receiving now, you can ask for your payment to be adjusted to match that figure. There are a few things to note, however. You cannot receive Social Security disability benefits and your spouses full retirement fund– just any difference between the two to compensate. You should also know that when you begin receiving your spouse’s benefits matter. If you choose to begin receiving payments before the full retirement age, you’re subject to a 30% monthly penalty. To get advice about how best to manage your Social Security disability, or for help filing, call our attorneys of the Hankey Law Office in Indianapolis by dialing (317) 634-8565 today. Social Security Disability Insurance funds are expected to be drained in 2016, while Medicare is expected to run out of funds in 2026, a 2013 annual report by the Social Security and Medicare Board of Trustees stated. At the start of 2013, the Social Security Disability trust fund ratio decreased by 85 percent, leading to this prediction. The trustees said the depletion of funds in both the Social Security and Medicare insurance programs is due to several factors: a large population of baby-boomers obtaining retirement benefits and a decreased number of people working, adding to the funds. The Medicare Hospital Insurance funds are predicted to be depleted in 2026 as it is expected to pay more in benefits without bringing in enough income to cover those expenditures. If you are an Indianapolis resident in need of Social Security disability benefits, get your questions answered and the help that you need from the experienced lawyers at the Hankey Law Office, P.C., by calling 317-634-8565. The Social Security disability insurance trust fund is expected to drain three years from now, ahead of Social Security and Medicare, a federal report stated last year. An update on the health of the disability program will be released on May 30 by the trustees of Social Security and Medicare. Currently, predictions state that Social Security will be exhausted in 2035, while Medicare will be exhausted on 2024. Income security vice president at the National Academy of Social Insurance Virginia Reno said benefits would be stopped, an event which has not happened previously, if the funds ran out. Exhaustion of the Social Security trust fund will result in only 80 percent coverage for the disabled and their families. If you or someone you know is interested in applying for Social Security disability benefits, you can get all your questions answered by the lawyers at the Hankey Law Office, P.C., by calling 317-634-8565 today.